My favorite of the bunch is still Sazerac 18. Buffalo Trace did a fantastic job with this release, along with Weller and Eagle Rare. George Stagg isn’t as good as last year’s phenomenal release, but it doesn’t mean it’s bad. This year’s slightly oak-heavy release still comes with a recommendation. Spirits-based websites and blogs generally post a Top 10 list or Holiday Gift Guide at the end of the year. I did the same in 2014, but this year I’m changing things up a bit. Reflecting back on the past year, I came up with a listing of whiskies that I not only thoroughly enjoyed, but ones that I found were memorable. These cover both American and Scotch whiskies, regular offerings and limited editions. Except for the top spot, these are listed in no particular order. George T. Stagg (2015) Bourbon – Hands down my favorite whiskey of 2015. There’s so much flavor packed into the bottle, yet this whiskey still maintains a bit of nuance. 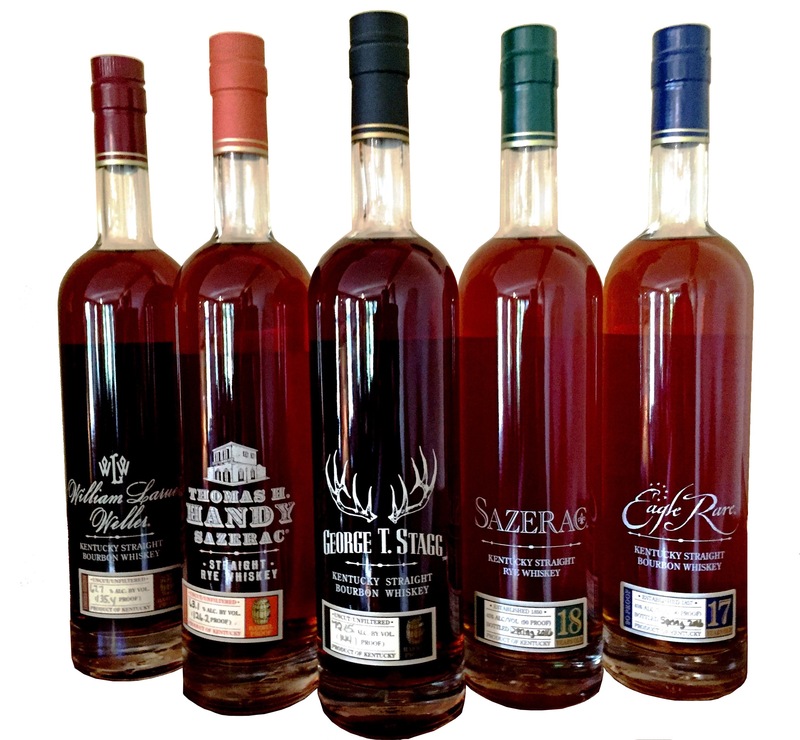 Still king of the Buffalo Trace Antique Collection and the best bourbon coming out of Buffalo Trace distillery. Michter’s 10-Year-Old Single Barrel Bourbon – This one is a close second. An exquisite expression from the folks at Michter’s. While their standard small batch bourbon is solid, this 10-year single barrel offering is leagues ahead. Four Roses Limited Edition Small Batch 2015 Bourbon – Jim Rutledge’s last limited edition release. What a great way to say goodbye to this industry giant. Another classic expression from Four Roses. Elijah Craig 18-Year-Old Bourbon – Not the oldest Elijah Craig release, but EC18 is the one that stands as most balanced. This is one outstanding release from Heaven Hill. Glenfarclas 17-year-old Single Malt – This sherry bomb is brimming with dried fruit, wood smoke and spice. This is also my wife’s favorite whisky, and she doesn’t drink whiskey. Highland Park 18-year-old Single Malt – Oh man! What a whiskey – luscious dried fruit, malt and heather all play together in near perfect harmony. Wild Turkey Master’s Keep 17-Year-Old Bourbon – I don’t have a formal review, but had a chance to sample this exquisite bourbon over the summer while on the Wild Turkey bus. Flavorful and balanced, especially for such an old Turkey. George Dickel 9-Year-Old Hand Selected Barrel Tennessee Whisky – While not a new release, this whisky is a staple in my household. It just may be the best whiskey coming out of the Dickel Distillery. Johnnie Walker Select Casks Rye Cask Finish Blended Scotch Whisky – The newest blend from Johnnie Walker, JW Select Cask Rye Cask Finish takes the best parts of JW and American rye. This is one of the most interesting whiskies I’ve tasted all year. Pikesville Rye Whiskey – A nice step up in quality from Rittenhouse Rye, Pikesville Rye hits all the right notes at an affordable price. Michter’s Barrel Strength Rye Whiskey – Another powerhouse release from Michter’s. Laphroaig 10-year-old Cask Strength Single Malt – To me, this smoky beast captures the best qualities of the Laphroaig distillery. The year is not over yet. I’ve got some potentially incredible whiskies waiting to be tasted. Who knows if they’ll make this humble blogger’s list of favorite whiskies of 2016. Until then, Sláinte! What’s the best whiskey you’ve tasted this year?